Frankfurt am Main ("Frankfurt on the Main," the city's full name) is Germany's banking and financial powerhouse. It's home to banks from around the world, as well as the European Central Bank. Many are housed in the sleek, modern skyscrapers that define Frankfurt's skyline. (These buildings have even spawned nicknames for the city, including "Main-hattan" and "Bankfurt.") As an international business center, Frankfurt attracts expats from around the world, so it's a very cosmopolitan place. It ranks as Germany's fifth-largest city, with a population of 717,000. Behind the modern gloss, Frankfurt's roots run deep. Charlemagne is celebrated as the city's founder, although the ancient Romans were here, too. Unfortunately, much of the city was destroyed in World War II, by fires that resulted from Allied bombing. Some historic buildings and monuments have been rebuilt or restored, but most of Frankfurt's old half-timbered houses were lost. The city is still in the process of restoring some districts with a mix of modern and old-style architecture. Frankfurt straddles the Main (pronounced "mine") River, with the Old Town and performing arts venues located on the north side, and many museums lining the south bank. Museum buffs are definitely in for a treat, and can enjoy several art museums, plus others focused on history, film, architecture, Jewish culture, porcelain, applied arts, archaeology and more. You'll also find parks and botanical gardens, a wide variety of restaurants, and plenty of shopping. If you've flown to Europe much, you've no doubt passed through Frankfurt's airport -- one of the busiest in the world. Its huge train station is also a major European hub, with more than 350,000 passengers using it every day. As a transportation center, Frankfurt provides easy access to and from the rest of Germany and beyond. Rudesheim am Rhein is a German winemaking town in the Rhine Gorge, and part of the UNESCO World Heritage Site in this region. It lies in the Rheingau-Taunus-Kreis district in the Regierungsbezirk of Darmstadt, Hesse. Known as Rudesheim, it is officially Rudesheim am Rhein, to distinguish it from Rudesheim an der Nahe. It is a major tourist attraction, especially for foreign visitors. Remagen is a town in Germany in the Land Rhineland-Palatinate, in the district of Ahrweiler. It is about a one-hour drive from Cologne, just south of Bonn, the former West German capital. It is situated on the left (western) bank of the river Rhine. 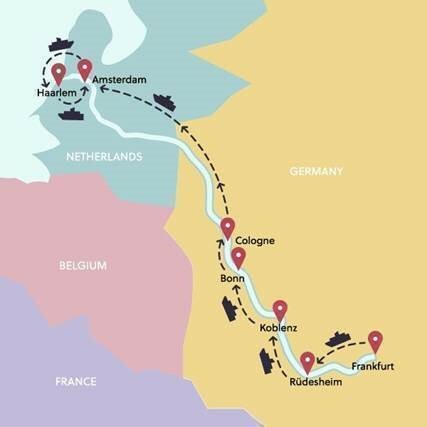 There is a ferry across the Rhine from Remagen every 10–15 minutes in the summer. Remagen has many beautiful and well-maintained buildings, churches, castles and monuments. It also has a sizeable pedestrian zone with plenty of shops. Overlooking the west bank of the Rhine just north of the city centre is the Apollinariskirche. It has an observation deck that is only open to parishioners on Sundays. Pedestrians reach the church via a dirt trail that passes a series of roadside monuments representing each of the fourteen Stations of the Cross. The church grounds contain an outdoor crypt and an abbey. Further down the river is one of the many castles along the Rhine, perched even higher than the Apollinariskirche. Despite being Germany’s oldest city - founded around 30BC - Cologne seems remarkably fresh-faced and is a very family-friendly city. While tourists make a bee-line to Berlin, Cologne just keeps smiling quietly to itself, revelling in its relative obscurity. Situated on the banks of the Rhine, its magnificent cathedral, the Dom, is one of the largest Gothic cathedrals in the world. It took six centuries to build, and, as a result, is rich in history – it’s even said that a shrine behind the altar contains the bones of the Three Wise Men. Everywhere you go, the city enjoys a rich cultural heritage that buzzes with creativity and self-confidence. Cologne is the perfect destination for families travelling by train - Mum can stock up on its famous perfume, while Dad samples several glasses of Kölsch, the local top-fermented beer. And for children, the zoo is a must – it features the famous 90 year old ‘Monkey Rock’ (home to many Hamadryas baboons), an elephant park, a very cool discovery train and beautiful gondolas. For both kids and parents alike, don’t miss out on the Imhoff-Stollwerck chocolate museum, an ultra modern glass building that overlooks the Rhine - named after Cologne’s very own Willy Wonka, Franz Stollwerck - who introduced chocolate production to the city in the 19th - century. Duisburg is a result of numerous incorporations of surrounding towns and smaller cities. It is the fifteenth-largest city in Germany and the fifth-largest city in North Rhine-Westphalia, with 499 845 residents at the end of 2016. It is the central city of the Rhine-Ruhr metropolitan area. The city is renowned for its steel industry. All blast furnaces in the Ruhr are now located in Duisburg. In 2000, 49% of all hot metal and 34.4% of all pig iron in Germany was produced here. It also has a large brewery, König. The University of Duisburg-Essen, with 39,000 students, ranks among the ten largest German universities. Amsterdam has always had strong ties to the water. Spread out over 70 islands, this cosmopolitan city boasts 60 miles of canals and 1,000 bridges. As early as the 13th century, tiny ships sailed from this port into the challenging Zuider Sea. A direct connection to the North Sea was made with the construction of a canal in the early 19th century. The most dramatic alteration of the landscape came in 1932 with the building of a 22-mile dam that sealed off part of the Zuider Sea, allowing large landfills. Amsterdam gained renown in the 15th century when it became a major trading center, steadily assuming commercial leadership and thus controlling the country’s finances, a trend that remains to this day. Amsterdam is most famous for its narrow, gabled houses lining the canals. The historical center is full of interesting attractions such as the medieval weighhouse, the Royal Palace on Dam Square, and the Nieuwe Kerk or New Church which was built in 1468. From the time of Rembrandt, Amsterdam has been revered as an artistic center. Today the city is renowned for its celebrated museums – the Rijks, Van Gogh and Stedelijk Museums to name but a few. It also is a shopper’s city, featuring everything from the famous flower market to glassware, Delft porcelain, cheese and wooden shoes. Its most glamorous industry is the diamond trade. Within a relatively short distance from Amsterdam are the flower centers of Aalsmeer, the picturesque fishing villages of Volendam and Marken, cheese markets at Edam and Gouda, and historic Haarlem which is the main center of the bulb-growing industry. You may explore Amsterdam’s center on foot or join the thousands of residents who favor riding their bicycles. 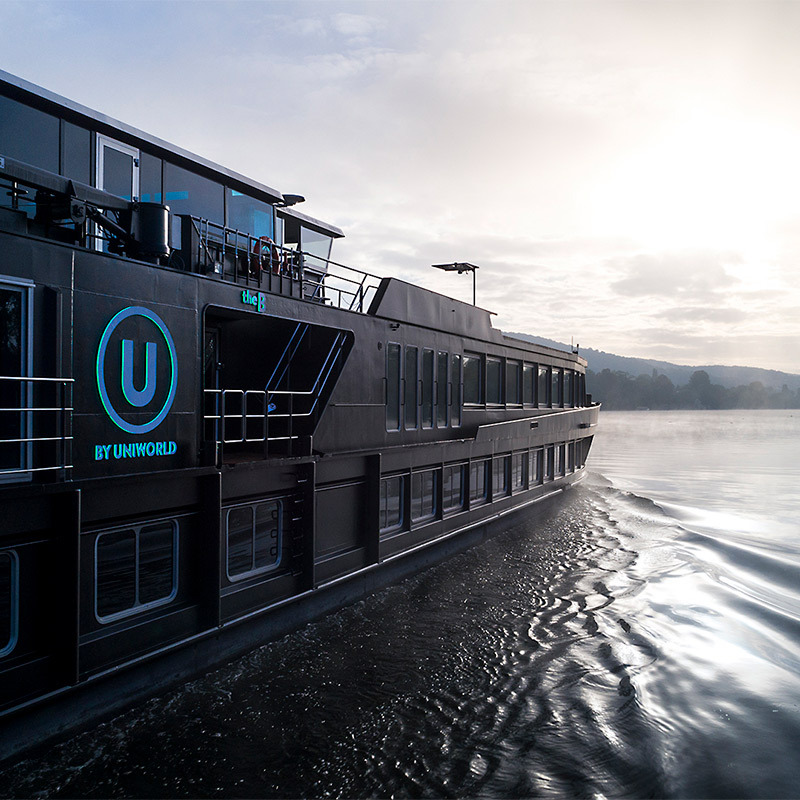 One of the most delightful ways to enjoy the city’s famous sights is from a glass-topped sightseeing boat. Gliding through the canals, the boat passes the characteristic gabled houses and negotiates picturesque arched bridges. Haarlem; predecessor of Harlem in the English language) is a city and municipality in the Netherlands. It is the capital of the province of North Holland and is situated at the northern edge of the Randstad, one of the most populated metropolitan areas in Europe. Haarlem had a population of 159,556 in 2017. It is a 15-minute train ride from Amsterdam, and many residents commute to the country's capital for work.